Right out of the box, you'll count on your Xerox® VersaLink B400 black-and-white laser printer to consistently and flawlessly perform the tasks that make your business work more efficiently. From IT-free installation wizards, to step-by-step configuration options, you're ready to go—hassle free. Count on day in, day out reliability thanks to our trusted paper path technology. The VersaLink B400 printer is loaded with features and time-saving Xerox technologies designed to speed up information sharing and reduce inefficient workflows. Print with total peace of mind knowing that the VersaLink B400 Laser printer delivers a spectrum of stringent security features, including Secure Print and card authentication to control access. With the customizable 5-inch colour touchscreen, you can tap, swipe and pinch your way through tasks and functions with mobile-like ease. Upward mobility for every work style. 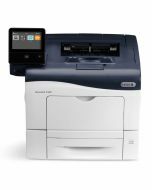 The Xerox® VersaLink B400 laser printer gives you the freedom to work where and how you want—with direct connectivity to Google Drive™, Microsoft® OneDrive® and DropBox™, and access to additional options through the Xerox® App Gallery. 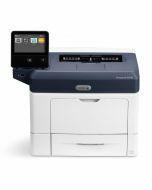 The ability to connect and print from multiple devices is key for today's worker, and the VersaLink B400 printer meets the challenge with optional Wi-Fi and Wi-Fi Direct, plus Apple® AirPrint®, Google Cloud Print™, Xerox® Print Service Plug-in for Android™, Near Field Communication (NFC) Tap-to-Pair and Mopria. Product Size Dimensions (WxDxH): 18.1 x 16.8 x 13.3 in. ; Weight: 30 lb.